Like many other Tier-2 cities in China, Tianjin has seen a significant amount of office supply come onto the market at the same time. Within the last five years, the city's total office stock has doubled, and reached 2,100,000 sqm by the end of 2015. The supply of Grade A buildings, which we define as generally wholly-owned buildings in core locations with superior specifications, more than tripled during that same time period, reaching 603,000 sqm. But while the actual office sector grows in size, and new completions improve in terms of building specifications, there has been little growth from the sectors and companies that occupied space in the earlier waves of office buildings. As a result, many of the newly completed projects have focused on filling space with P2P companies â companies that provide a platform for connecting lenders and borrowers - and other related wealth management firms. In recent quarters, these companies have come into the market at unprecedented rates, usually occupying large sizes and paying rents that are slightly higher than the market average. But while this has provided relief for landlords in the wake of a supply wave, the P2P and wealth management industry have proven to be less than stable as some companies experience bankruptcy or shut down due to regulation. For office buildings to be healthy in the long-term, they need a diversified and dependable tenant base. Previous office buildings in Tianjin had a broad mix of foreign and domestic firms and attracted a wide selection of industries. Strong economic growth in the 1990s and early 2000s fueled office demand for manufacturing and trade-related industries and brought a lot of MNC's to central Tianjin. The logistics sector has also been a key driver of office demand, historically, as Tianjin's port area helps facilitate trade throughout north China. Built in 1991 as the city's first Grade A building, the Tianjin International Building (TIB) entered the market at a time when Tianjin had very little office stock and has since been the recipient of demand from all of the above industries. Currently, 43% of the space in TIB is leased out to MNC's while its most represented sectors are logistics (25%), banking and insurance (20%) and trade (19%). The Exchange Towers 1 and 2 -- completed in 2002 and 2007 -- followed as Tianjin's second and third Grade A office buildings. Much like TIB, they are also centrally located in Tianjin's primary CBD area and have a wholly-owned ownership structure. These two factors, and the fact that the two towers were completed at the height of the city's economic growth, led to a number of MNC's locating their Tianjin operations there. The Exchange Towers 1 and 2 have the highest concentration of MNC tenants in the market at 58 and 61 percent respectively. Traditional sectors within the projects are also well represented. For example, the logistics sector accounts for about 33 percent of the space in The Exchange Tower 1, followed by trade (28%) and professional services (16%). The most common tenant types in The Exchange Tower 2 are banking and finance (35%), professional services (26%) and logistics (10%). Since 2007, five more Grade A buildings have been completed and, on average, most still have considerable vacancy. Furthermore, the average tenant structure of these new projects tells a different story. Compared with the first three Grade A completions, the overwhelming majority of the occupants in new Grade A buildings are domestic. Only about 16 percent of the occupants are MNC's and less than five percent are MNC's that sought space for a new set-up or expansion within Tianjin. While this indicates that domestic firms are beginning to realize the importance of leasing quality office space, and that is a good thing, it also shows that MNC's are not expanding in Tianjin at the same rate as before the Global Financial Crisis. We have seen demand shift from being 55 percent foreign firms to 84 percent domestic. Outside of TIB and The Exchange Towers 1 and 2, about 47% (or 71,000 sqm) of Tianjin's Grade A tenants are P2P or wealth management companies. The high occupation rate of P2P and wealth management firms in new Grade A projects is alarming because of the cyclical nature of the industry. Financial innovation of this sort is not a new phenomenon - home purchase restrictions (HPRs) in 2010 led to the rapid development of wealth management products (WMPs), and firms offering them, as individuals sought new ways to achieve investment returns. While P2P companies have a necessary place in the market - they provide much needed capital for individuals and SMEs (small-medium enterprises) that would not typically be attainable through traditional financing channels - the industry is particularly risky because it is, or was for a time, largely unregulated. The recent closures of Shentong Dada and Anhui Yucheng's E-Zubao are noteworthy examples of the risk level attached to leasing large amounts of space to P2P and wealth management firms. The two firms left over 8,000 sqm of space vacant across Grade A projects in Tianjin following their departure late last year. To put this in perspective, that equates to just over three percent of the total occupied space by all Grade A projects, enough to have a large impact on the market. Somewhat ironically, the large size requirements of P2P and wealth management firms help landlords boost occupancy rates while leaving them exposed to greater levels of risk. Compared with other sectors, P2P tenants and wealth management tenants are much more likely to lease whole floor space. 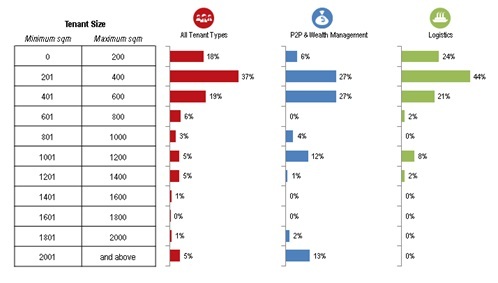 While about 13 percent of tenants from the P2P and wealth management industries lease space greater than 2,000 sqm, only about three percent of tenants from all other industries lease space of that size. Moreover, P2P and wealth management companies are not your typical, white-collar office tenant. Companies with space adjacent to these tenants complain that they disrupt their office environment by having frequent client visitors who create noise and abuse public areas. Because of this, landlords in Grade A projects sometimes impose restrictions on P2P tenants like disallowing ones that generate high visitor-traffic from leasing space. They also may try and compensate for flight-risk by asking for higher rents or larger deposits up front. 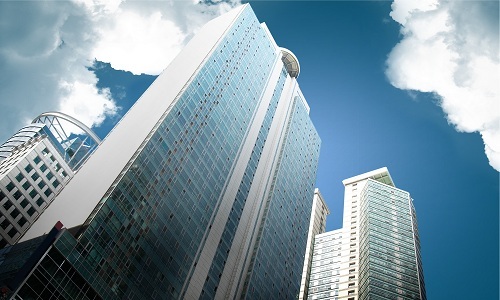 However, given Tianjin's tenant-favorable leasing environment, where new leasing demand is harder to come by, landlords in most projects still elect to lease space to P2P or wealth management firms, especially given a rental value higher than market average, which would otherwise rest vacant. The office market in Tianjin faces a dilemma. Many of the new buildings are in fact better from a design and hardware point of view than their predecessors. They have larger and more efficient floor plates, more natural light, higher ceilings, raised floors, and more space for amenities in their retail podiums. All of these are things that many foreign firms would recognize and be willing to pay for, but for the most part, have not expanded in Tianjin in recent years. Landlords in newly completed Grade A projects will instead shift their focus to attracting existing MNC tenants looking to upgrade their space. The high concentration of MNCs in the early Grade A projects has led to agglomeration among competing companies from the same industry. This situation is uncommon in Tier-1 cities with a greater number of high quality office buildings as competing companies tend to keep their distance between one another to maintain a competitive advantage. Additionally, inefficient planning and the smaller floor plates seen in the earlier Grade A completions have inconvenienced many foreign companies leasing large spaces as they are often spread across multiple and sometimes non-adjacent floors. These factors should lead to a greater dispersion of MNC tenants, especially as more high quality space comes onto the market. In summary, Grade A buildings completed in the early stages of Tianjin's office market development have each built up a stable base composed mainly of MNC and domestic tenants from Tianjin's traditional industries - logistics and manufacturing. With low vacancy rates and little volatility in their tenant mix, these projects have maintained stable rental incomes and, as such, should see relatively higher valuations. However, with muted demand from the types of companies that filled earlier completions, many of the newly built Grade A projects have been forced to focus mainly on the current hot industry - P2P and wealth management - and may see vacancy rates rising if the sector faces further regulation or consolidation. Landlords in these projects will begin to focus on diversifying away from this industry-specific risk if they are to be stable in the long term. Though what is likely to happen is a few of the new buildings will attract a cluster of foreign firms looking to upgrade, some buildings may focus on stable domestic firms, and some will end up being empty and distressed.